Multi-row or 4 row Cylindrical Roller Bearings are primarily designed and used as roll-neck bearings in rolling mills. The four rows of rollers lends itself to carry large radial loads for the given bearing cross section. Contoured rollers with tight diametrical tolerances maximize the ability of this bearing to evenly distribute the load to all four rows. Most common types include the use of a machined brass finger cage or a machined mild steel finger cage. No suffix is required for the brass cage but the SM suffix is used for the steel. In larger sizes, the use of a steel pin type cage with hollow rollers is standard. Many outer race and inner race configurations and design types are available to meet installation or interchangeability requirements. Most bearings are supplied with C4 Internal Radial Clearance and P5 Accuracy to perform well in these roll neck applications. Our patented Blended Bevel leading edge on our Inner Races is standard. 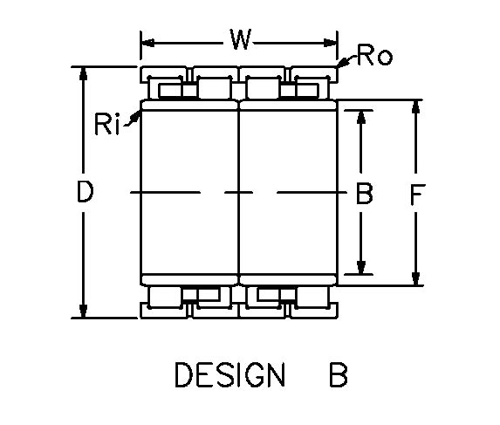 This unique design allows for a smoother installation of the Chock/ Outer Race Roller Assembly over the Roll mounted Inner Race O.D. when robotic stand building equipment is used. It can also help when larger chocks using bearings of this design are mounted using overhead cranes. In applications requiring concentric grinding of the mounted inner race and roll body, an “RG” suffix is designated to specify a race with extra stock for grinding. 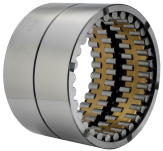 These bearings are also available with a tapered bore inner race for applications requiring greater accuracy or control of mounted radial clearance. The suffix “K” designates a 1:12 or K30 designates 1:30 taper if needed. Four Row, multi-row bearings are commonly used in the primary metals industry to roll ferrous and non-ferrous materials. Used primarily on rolls in two high rod and bar mills, and backup roll rolls on four high mills, these bearings are industry interchangeable and are typically sold as Outer Race Roller Assemblies and Inner Race Sets.